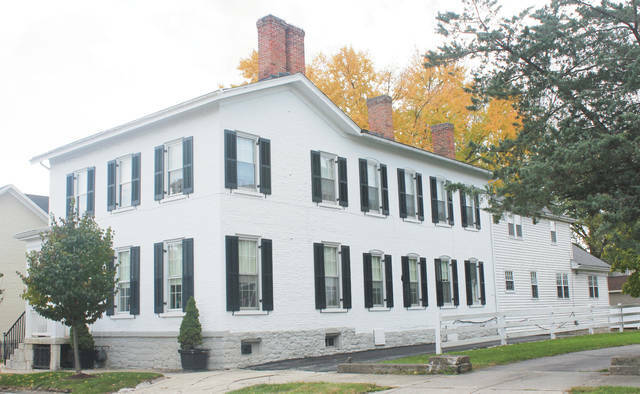 PIQUA — The Dorsey Jones House at 618 N. Wayne St. will be one of six historic homes showcased in the Piqua-Caldwell Historic District Association’s second annual Holiday Home Tour from 5-8 p.m. Saturday, Dec. 8. During the tour, visitors will enjoy music and a vintage sip or nip at each home. After purchasing the property in 1839, Dr. Godwin Volney Dorsey built the Dorsey-Jones House. This two-story, three-bay, brick Federal-style home features 18-inch brick walls and twin chimney stacks which are tied together, as were those of many of Piqua’s older homes. Dr. Dorsey used the first and second floors as living space, and his office was located in the basement. In 1853, Mathias H. Jones, a pioneer attorney, purchased the house and was responsible for the brick addition to the rear of the structure. In 1858, Jones served as representative to the Ohio legislature and his son, Walter D. Jones, served as Judge of the Common Pleas Court in Miami County for many years. Walter Jones’ daughter, Lola Hill, was a well-known newspaper personality. The house remained in the Jones family until 1951. In 1953, the property was purchased by Mr. and Mrs. James H. DeWeese, who completed the work already in progress to convert the home into two apartments. At that time, another portion was added to the rear of the brick portion, and the house is now 105 feet long. The original architecture of the brick portion of the home has been preserved, including the woodwork, flooring, stairway, windows, and two of the fireplaces. During the work done in 1953, the foundation of the original stable was uncovered and the stones were used in landscaping the rear yard. Tickets for the Holiday Home Tour are $25 each at Allisten Manor’s Flower Box, Mainstreet Piqua, and Readmore’s Hallmark in Piqua. Credit card transactions should be made at Mainstreet Piqua, 326 N. Main St.
Shelley and Chuck Black, co-chairs of marketing and advertising, suggest that tickets be pruchased early, as only 300 are available and last year’s tour sold out several weeks in advance.